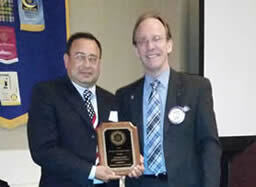 The Virginia Beach Rotary Club values all members of our community. To this end, each year we present the Doors to Opportunity Award to a local business that not only employs people with disabilities, but provides support and encouragement to ensure that each team member is working to their fullest potential. Additionally, our club presents the Special Achievement Award, which recognizes an employee within that business that has shown impressive growth during his or her time of employment, despite his or her different abilities. Read below for previous awardees. The 2017 Special Achievement Award was presented to Irving Ferguson, and Walgreens Store #7133 was presented with the 2017 Doors of Opportunity Award. Walgreens Store #7133 is managed by Mr. Andy Childress. Assistant Manager, Reathel Ingram, and her daughter Lila were at the meeting to accept the award. The nomination letter spoke of Andy’s supportive and understanding demeanor over the past 10 years working with clients with disabilities. Irving Ferguson was joined at the meeting with his mother, step father, and Job Coach, Kara Bullard. Irving’s nomination letter spoke to his keen customer service and problem solving skills he developed working for the Tricare Primary Military Clinic in Virginia Beach as an ID checker. Irving is also involved in wheelchair soccer, waterskiing, and practicing Aikido at the Princess Anne Recreation Center. Also in attendance at the meeting were Todd Condron and Krista Shanafelt, both employees at the Virginia Beach Community Employment Options office of the Department of Human Services. The 2016 Special Achievement Award was presented to Nathaniel Morell. Nathaniel began as a stocker in 2012, working one day per week and needing regular assistance. He now works three days per week, assists customers, and earned a raise for his exceptional work ethic and independence. The 2016 Doors to Opportunity Award was presented to Walgreens Store #13474, with special thanks to Ms. Shaw, who stated that Nathaniel enriches the lives of her fellow employees and customers by offering a new perspective. She encouraged his growth by offering new responsibilities. Our 2015 Doors to Opportunity Award winner is Burger King Restaurant number 18114 managed by Cesar Breucop. 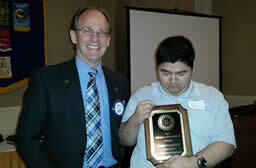 Cesar's store has employed persons with disabilities since July 2012. His nomiation letter states “Mr. Breucop understands that with a little support, individuals are capable of working in a competitive workplace and being a contributing member of society.” Past President Mike Summers presented the award. 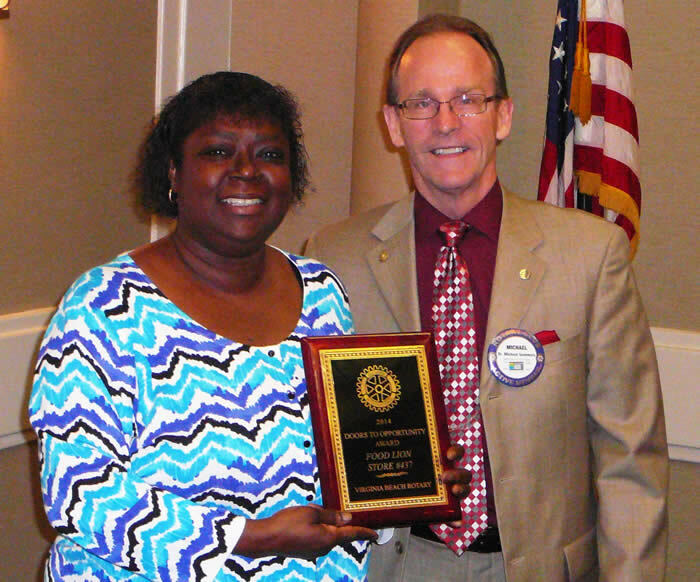 The 2014 Doors to Opportunity Award was presented to Food Lion Store #437. The award was accepted by Assistant Manager, Mrs. “T”. 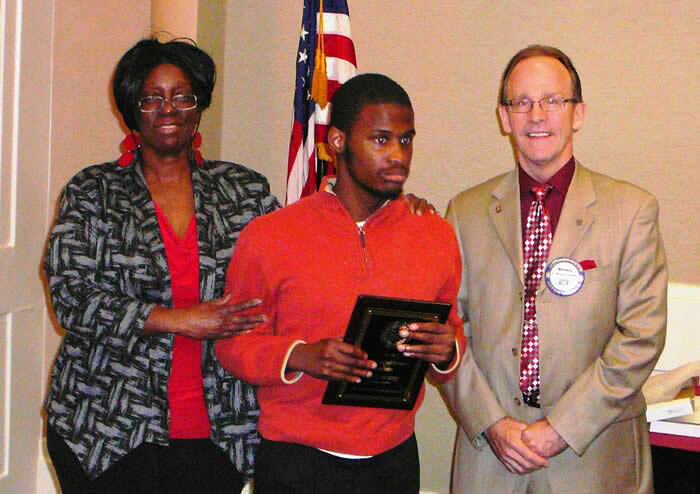 The 2014 Special Achievement Award winner was Jarel White, who accepted his award from Club President Mike Summers. Accompanying Jarel on his special night was his mother.